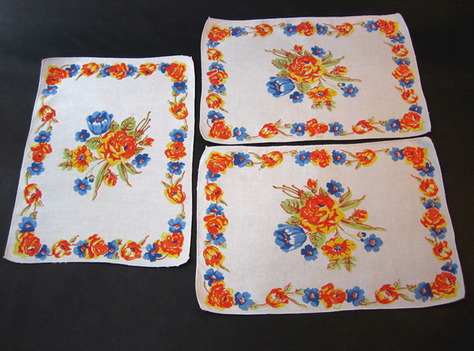 Striking mid-century print napkins on ivory linen with roses, tulips, and other flowers in blue, orange, red, yellow, and green. The central bouquet is surrounded by a garland border. Features rolled edge. This is a great example of classic mid-century design, with bold motifs in bright colors. Perfect complement for Fiestaware and other richly colored tablewares of the period. Excellent condition. No tears, holes, pulled threads, or stains. Some loose threads on edging.